At First Bond Water Enterprise, we are focused on providing sales and services with the highest levels of customer satisfaction – we will do everything we can to meet and even exceed your expectations. Custom Design And Build Water Treatment System 1. 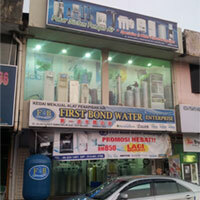 Ultra Pure Water Plant, Deionised Water Plant and Reverse Osmosis Plant. 2. Filtration And Pretreatment Water Plant. 3. Potable Water Plant and Ultra Filtration Plant. 4. Industrial Treatment Plant To Meet Environmental Regulation.